The Royal Canadian Mint (the main branch for production today is Winnipeg) markets its gold Maple Leaf coin as the "international symbol of purity." The gold Maple Leaf has been produced since 1979 (it was minted with 0.999 fine gold for the first four years before increasing the gold content to 0.9999 fine in 1983). Gold Maple Leafs should be handled carefully. Due to their high gold content, they may scratch or mar more easily than other 1-oz. gold coins. The government of Canada guarantees the purity, weight, and legal tender value of each gold Maple Leaf coin. For this reason, gold Maple Leafs have been internationally recognized since their introduction in 1979. 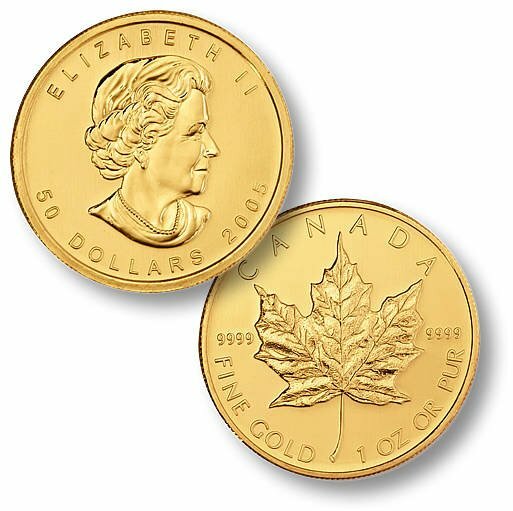 The front, or "obverse," of the gold Maple Leaf features a bust of Queen Elizabeth II. Originally, the bust depicted the Queen as a younger woman. The bust design changed in 1990 to feature a more mature portrait. In both versions, "ELIZABETH II" appears above the portrait; the coin's face value and date of issue rest beneath the bust. The back, or "reverse," depicts a Maple Leaf, the national symbol of Canada for which the coin derives its name. The gold Maple Leaf's reverse also lists the name of the country and the amount and purity of the gold - in both English and French, the national languages of Canada.